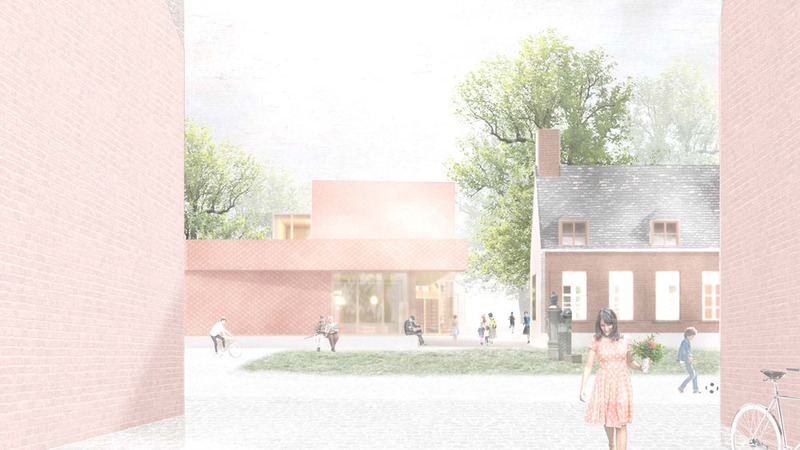 On the medieval square of Zandhoven, the new community centre will make a connection between the square and the hidden garden, opening it up for public use. A low square facade connects to the existing small scale building around the square, where the library tower behind is a vertical accent in the background. The building surrounds an existing garden with the monumental Vredegerecht and some monumental trees. By setting the building apart from its neighbour, a new passage into the garden appears, making the garden public and putting the entrance in the middle of the project, in the garden. The library is set behing the community hall in a vertical sense and mimics the tree size. Large openings allow views of the large trees to enter the interior spaces. The facade consists of a pattern of ceramic scales, referring to the ancient nickname of the villagers - ‘Doppenrapers’. The vertical library is a sort of bell tower, nestling in the trees, making the project well visible in the village. This project is a cooperation between krft and Bob McMaster.